I had a unique opportunity to spend several days at the 2008 Tennessee State Fair. There was so much to see, it will take 100 images to get it all in. 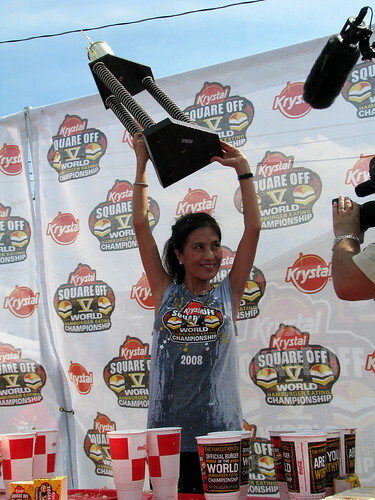 One approach to take when describing this picture is inspirational: Even a diminutive woman can win in the male dominated sport of competitive eating, just as Juliet Lee did here at the Nashville Qualifying round of the 2008 Krystal Square-Off. As she holds up her trophy she smiles for the camera, which is ESPN. Essentially, she started as a crowd favorite because a petite woman was competing with the big boys, but her eating was half of the burger not reaching her mouth. Look at the grease-soaked shirt!